Paris Motor Show 2016 (Mondial de l’Automobile 2016) is happening right now! If you don’t have the chance to find yourself in Paris these days, I will give you a glimpse by sharing the most beautiful concept cars from the stands. Overall, the new styles and concepts introduced at the show depict technologies that will be included in the models of tomorrow, few of them being scheduled to be released in future years. At this point, manufacturers are finally in agreement. Virtually all concepts that were unveiled are 100% electric, equipped with digital dashboards and they are prepared for autonomous driving. In this regard, the technologies are already available, but we need to wait at least one decade until the electric cars will be the new standard around the globe. On its gigantic stand at Paris Motor Show 2016 (Mondial de l’Automobile 2016), Renault showcases its main star by placing it over an artificial hill. 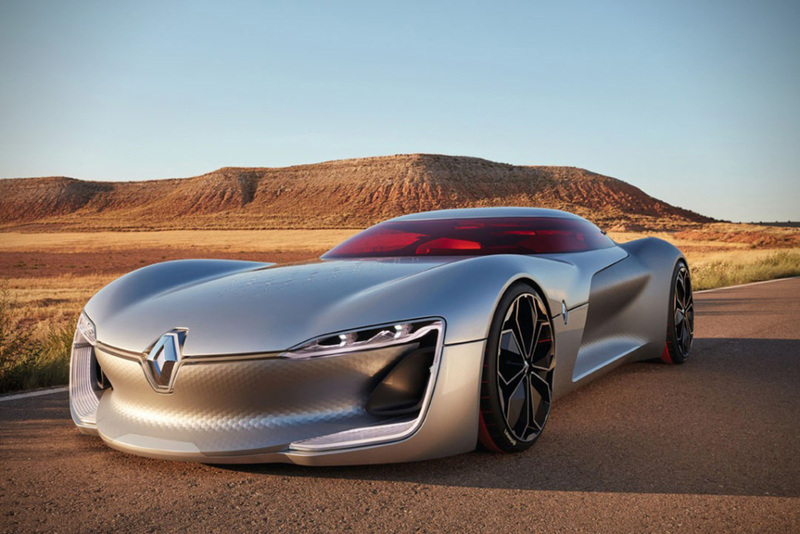 Their concept car, Renault Trezor, is undoubtedly the showstealer of the Parisian salon. This racing car is incorporating the silhouette of a GT from the golden age of automobiles (1950s and 1960). It measures 4.70 meters long, just under 1.10 meters tall and nearly 2.20 meter wide. The detail that’s most striking about Trezor is the presence of the strange honeycomb shaped patterns on the bonnet (rear bodywork). According to the manufacturer, these hexagonal shapes provide an air intake variable geometry. The windshield is provided with a red filter. The surprise is even greater when you want to get inside the car. There are no doors! Trézor opens just like a flying saucer. Specifically, the entire front part of the concept car rises in order to give access to the interior. Dressed in red, the interior is just like an invitation from the future, rhyming with the classic yet futuristic silhouette of the body. Even so, the materials used for the interior are conventional: metal, leather and even wood. Inside, everything is activated by touch and the instrument panel displays digital images; it can be switched to displaying a map for navigation, or it can display other driving information. You can even watch entertainment, especially when the car switches to autonomous driving mode. The equivalent of a touch pad is placed between the seats and it features various car settings. The steering wheel, with its distinctive appearance is also equipped with touch controls deployed on three small screens. Under the long hood we find the Formula E electric motor developing 350 horsepower. According to the manufacturer, it takes only four seconds to reach 100 km / h. The batteries are placed as low as possible on the chassis and the manufacturer suggests that Renault Trézor has an autonomy of 300 km. Still being stigmatized for cheating on emission standards, Volkswagen tries to rehabilitate its image by playing the ecology and innovation card. The German automaker introduces a concept that’s 100% electric and futuristic. Introduced with stye, VolksWagen I.D. marks a brand revolution that could be as important as the arrival of the famous Beetle. At this point, you should know that the I.D. presented at Paris Motor Show 2016 (Mondial de l’Automobile 2016) is not a concept car, as opposed to Renault Trézor, but rather a demo. According to Herbert Diess, the president of the brand, this car is expected to hit the market around 2020. Its price could be equivalent to that of a well equipped Golf (about 25,000 euros). Aesthetically, the design is not revolutionary – rather minimalist and clean. I was able to spot the modern lines of the interior that are uninterrupted thanks to the lack of buttons, levers or other irregularities that are usually found on common cars. The atmosphere of the interior is uncluttered and, frankly, the feeling of space inside the car is really important. To achieve this and to optimize the layout, the manufacturer has developed a modular platform called Modular Electric Drive (MEB) that can certainly suit several models in the range. All the information and settings options appears on the dashboard’s screen, but also on the windshield thanks to an extended display. The commands on the display can be controlled via voice or gestures. By pressing the VW logo in the center of the steering wheel, it retracts and provides access to the dashboard. This is autonomous mode. 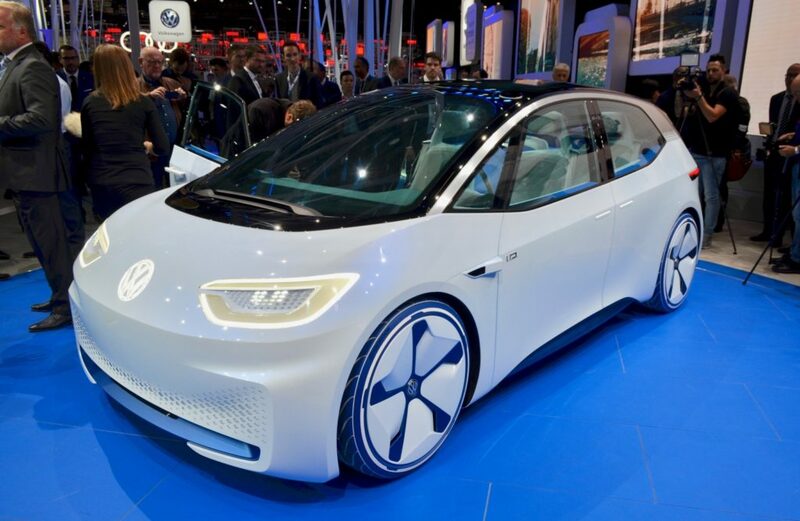 With ten laser scanners, radar ultrasound, cameras and data processing via VolksWagen cloud, the I.D.. can recognize and ensure avoidance of bicycle and pedestrian on highway at speeds up to 130 km / h. Better yet, the I.D.. can park itself in the parking lot or other places it “already knows”. 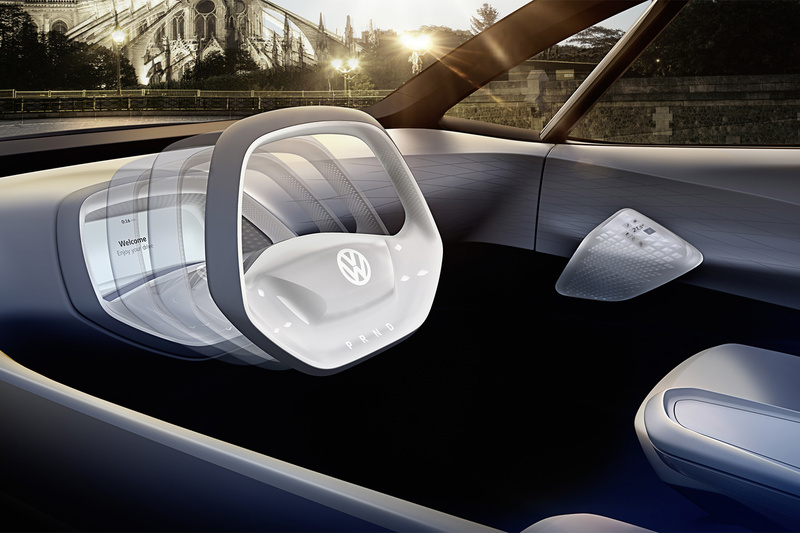 This is another concept that Volkswagen is already working on through the V-Load project. VolksWagen I.D.’s electric motor develops the equivalent of 170 horsepower. The batteries are distributed over the entire floor surface. They are supposed to deliver a range of 600 km per charge. In order to recharge, I.D.. has an interesting feature located under the front of the vehicle that can regenerate battery by induction. Finally, the car’s ultra-connected, since it is inseparable from a mobile device that allows it to start and to exit the parking lot, for example. Finally, each passenger has its own interface to manage the entertainment features and air conditioning. On the stand of Mercedes, journalists were introduced to a concept SUV that projected a blueish light signature on a glass grille. The famous logo is backlit and this grille will probably be used in Mercedes’ all future electric cars. The manufacturer promises up to 10 models for 2025. For the occasion, the concept presented inaugurates EQ, a new brand devoted to electrical. The concept introduced at Paris Motor Show 2016 (Mondial de l’Automobile 2016) was very successful and it should be out by 2020. In order to provide an autonomy of 500 km on a single charge, the SUV has two electric motors, one on each axle. Both accumulate 408 horses. Just like VolksWagen I.D., charging may be carried out by induction. However, by charging the car for five minutes from an electrical power source will provides enough juice to cover 100 km. The manufacturer emphasized that the batteries for this car will be produced in Mercedes’ factories. The cabin is clean, following the electric car design trend from this year. The cockpit is equipped with a large digital display. It is managed via an integrated touch pad located between the two seats. For entertainment, the rear passengers also have touch screens integrated in the front seatbacks. 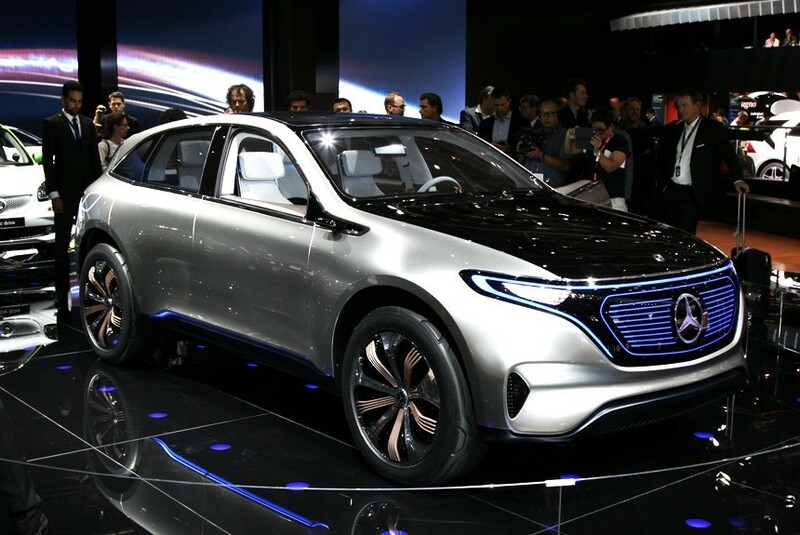 This electric SUV should be sold at a price equivalent to that of a GLC class model: $50,000 (about 44,000 euros). This year at Paris Motor Show 2016 (Mondial de l’Automobile 2016), Citroën does not offer an autonomous car or a 100% electric model. This single motor vehicle is a rechargeable hybrid that should be available starting 2019. The thermal part delivers 200 horsepower and the electric part delivers 110 horsepower to the rear axle. The electric range is limited to 60 km which is far less than other concept designs in this list. If you look closely, you will recognize the characteristic silhouette of the old DS sedan. The car reveals an interior that mixes a lot of styles and materials (walnut, woodwork). The instrument panel consists of a large big screen and the car is equipped with a head-up display on the windscreen. As side features, the Citroën CXperience has active components placed at the bottom of the car to improve the air flow at the wheels and also used for cooling. The car is also equipped with hydraulic suspensions. Walking from stand to stand, we finally stop at Toyota’s. Their FCV Plus concept is really hard to miss since it looks like nothing we have seen before. It is compact and its sharp lines suggest a futuristic style. Unlike other manufacturers, the Japanese company went for a hydrogen engine on this concept car. I must say it is a pioneer in the field. Their concept design powered by fuel cells is not just a vehicle built for the city and short trips, it can also power a generator on wheels for your home. According to Toyota, this vision could become reality in a near future, probably (hopefully) in fifteen years. 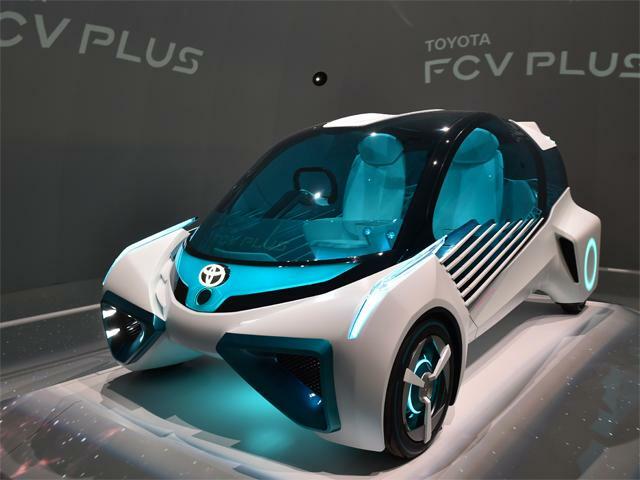 To animate the FCV Plus, each wheel has its own electric motor. The fuel container is placed in the rear of the vehicle. So, we are talking about a 100% electric car that relies on hydrogen, unlike any other concept electric cars introduced at this show.